Bring a piece of iconic design to your home. The Artek Icon Poster called the Paimio presents the chair designed by Alvar Aalto in 1931. The Paimio armchair is one of the most beautiful chairs designed by Aalto and the chair was created as a part of the Paimio Senatorium's overall project. 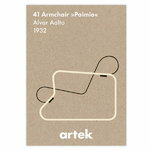 Alvar Aalto recieved the commission in 1929 after winning a design competition.